Eltham Palace in 1828 was in sorry state. “This stately hall is now used as barn, and the men thresh the corn where, in ancient days, Edward III held a Parliament, and gave a sumptuous entertainment to the captive King John of France,” reported the Sussex Advertiser. And although demolition was expected to “shortly take place,” the correspondent noted that the fine structure of the Great Hall was “similar to that of Westminster Hall, and richly ornamented with finely-carved pendants”. It was a huge fall for grace for what had been such an important English landmark. Eltham Palace was built in 1290 and it became royal property in 1311. The palace with kings and queens, not least Henry VIII who knew it well as a child and as an adult made considerable modifications, including adding a (now lost) chapel. Hunting and other sports took place in the grounds outside, providing the perfect opportunity to wow visitors. And the surviving Great Hall – which would have had fine tapestries on the walls – was built between 1475 and 1480 for Edward IV and used for numerous feasts during festivals, like Easter and Christmas, and council. But it was badly damaged it the English Civil War and so Charles I was the last royal to use Eltham Palace. Falling into disrepair, it did become popular as a romantic ruin. John Evelyn described it in 1656: “Went to see his Majesty’s house at Eltham; both the palace and chapel in miserable ruins, the noble wood and park destroyed by Rich the Rebel”. Fast-forward to the 1930s when textile magnate, Stephen Courtauld and his wife Virginia, were looking for a country residence near London. 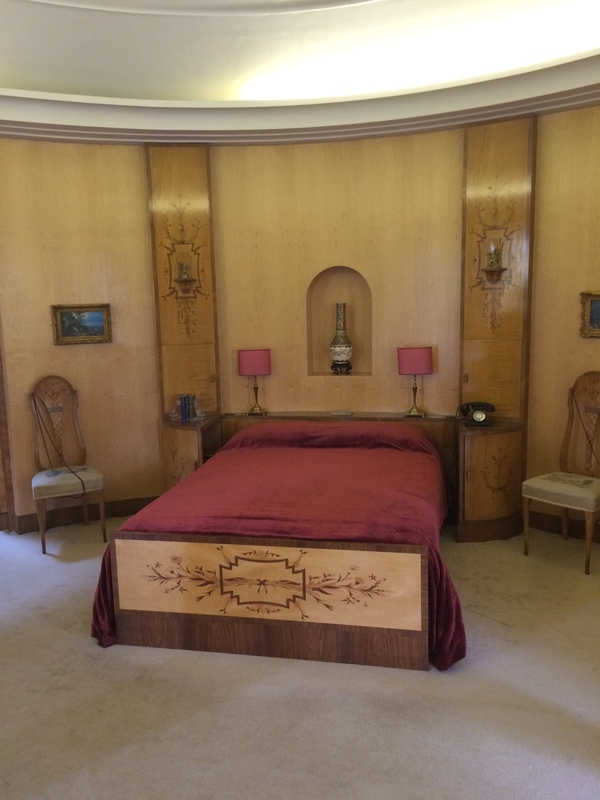 They bought the Eltham Palace estate and built a new luxurious Art Deco home, with all the latest designs, next to the medieval Great Hall, which they restored and used for lavish parties. The Courtaulds lived at Eltham Palace until just 1944, when they moved to Scotland and then Southern Rhodesia. They gave the property to the Royal Army Educational Corps who remained there from 1945 to 1992. Now managed by English Heritage, it re-opened at Easter this year after a £1.7 million renovation and is now extremely popular with visitors. I visited as part of my effort to walk the Capital Ring, a 78-mile route around the outskirts of London. But be warned, it’s not open every day as it is used for weddings and other functions, so definitely don’t plan to visit on a Saturday (I’ve made that mistake before and have not been let through by burly security guards on the outer gates). As a visitor today, you enter Eltham Palace by passing across the country’s oldest medieval bridge, but after picking up a highly informative audio guide, you immediately enter the Art Deco of the 1930s. The domed entrance hall to the Courtauld’s new building seems straight off a cruise ship – with images of their favourite places like Stockholm and Florence on the wooden panels around the edge – and was where they served their guests cocktails. This room is apparently popular with couples getting married today. Leading off this, the dining room is classical Greek-themed, with the ceiling covered with aluminium leaf and animal etchings drawn at London zoo on the doors. And the drawing room – where the couple relaxed with their guests after dinner and showed films of their extensive travels around the world – is in Italian style, with cream walls, Renaissance paintings and ceramics. Upstairs, Ginie’s bedroom was inspired by a classical temple, with columns as wall decorations and the bed at the centre. The ceiling coving conceals both lighting and heating for the room. And behind sliding doors there’s a walk in wardrobe – where I found visitors wanting to try on some of her outfits on display – and a massive bathroom. 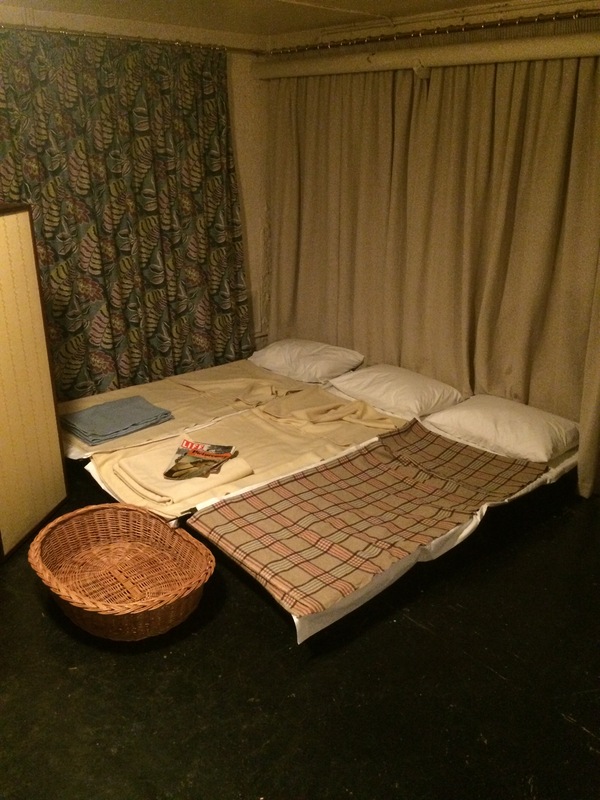 The basement was created for a photography dark room and games room – and has a billiards table that visitors can play on – but during the Second World War it was used as a shelter during raids. Camp beds are laid out on the floor and there are letters on display written by Gillie encouraging relatives to stay during the conflict. 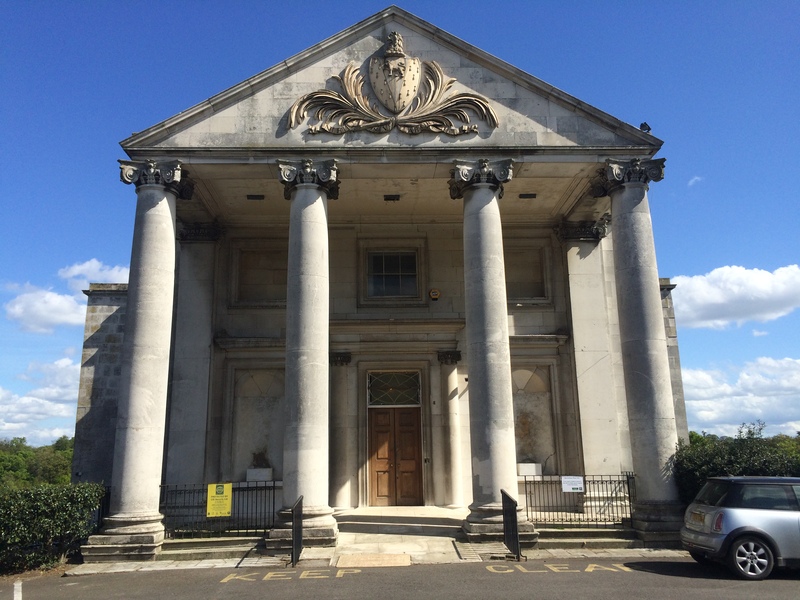 “There has been quite a lot of damage done in Eltham, and they have dropped some incendiary bombs on the Great Hall, doing a certain amount of damage, which I hope we shall be able to repair after the war if they do not hit us again,” wrote Ginnie in September in 1940. The Courtaulds had the latest gadgets, including underfloor heating and centralised vacuum system (housed in the basement) which apparently sometimes went wrong and fired dust around the rooms, instead of sucking it up. And a sound system was installed to pump music all over the house. 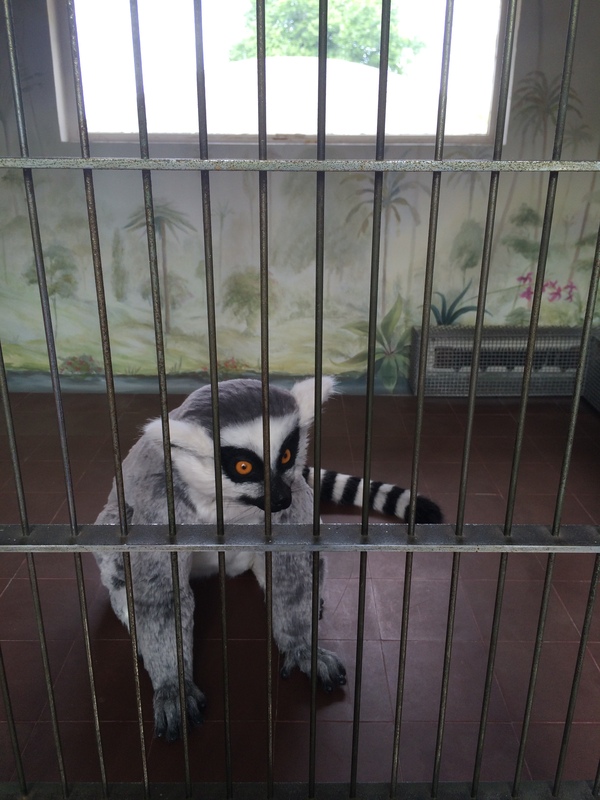 And I saw vast centrally heated cage that was home for Mah Jongg, the couples’ lemur, but who actually roamed free across the house and had a habit of nipping guests under the dinner table. I even spotted him in one of the family portraits. “Another charming hostess who kept a queer pet is Mrs Stephen Courtauld who has a ring-tailed lemur,” wrote the Derby Daily Telegraph in 1928. 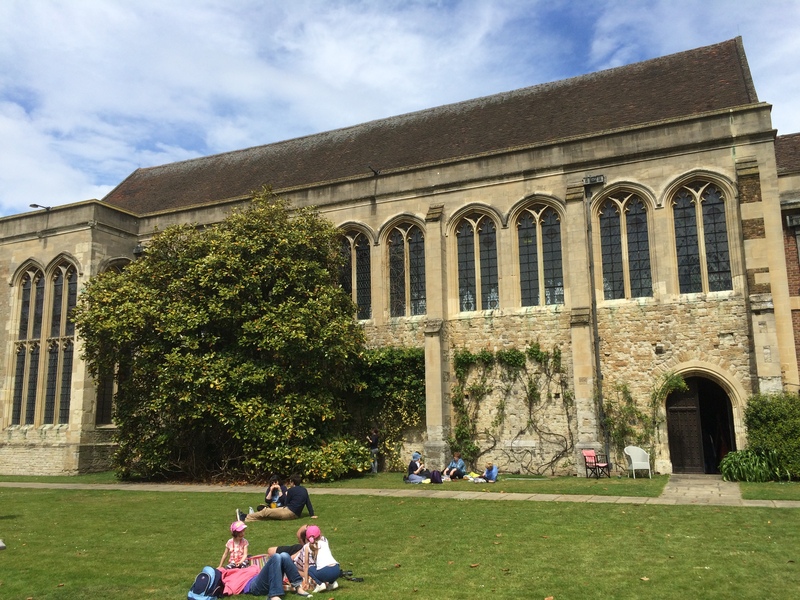 From the upper floor of their home, the Courtaulds could walk out onto a gallery which overlooked Eltham Palace’s original medieval Great Hall. The couple held parties here, inviting the likes of politicians, Royals (Queen Mary visited at least twice), Arctic explorers and film-makers. But the hall was a shell – and was being used as barn by a local farmer – when the Courtaulds bought the site, so they spent considerable sums renovating it, including adding new panelling and stained glass. Backing on to the Great Hall is the Orangery, now a cafe for visitors, which overlooks Eltham Palace’s fine gardens. 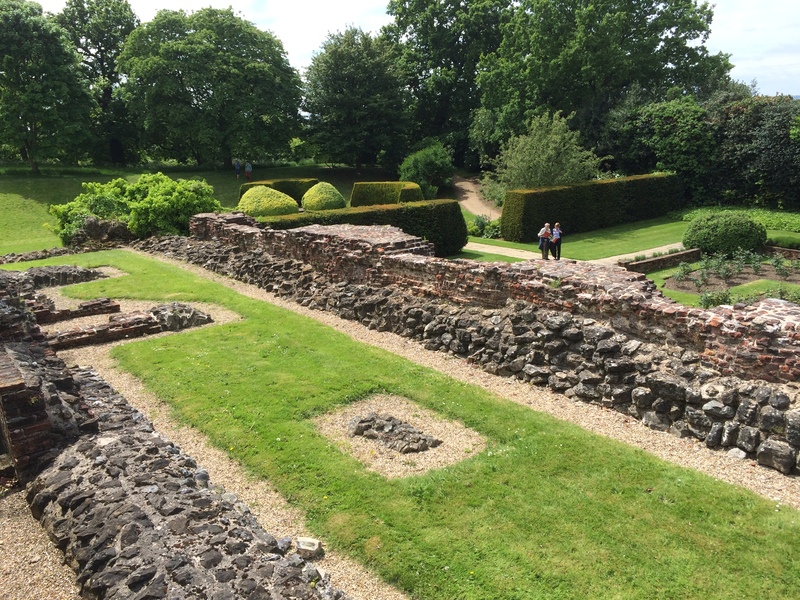 These are just as spectacular as the buildings and include a sunken rose garden, rockery with waterfalls and the whole site is surrounded by a moat, which children seem to enjoy exploring. When I visited, there were many people out on the lawns enjoying a picnic in the grounds. And although much of the medieval fabric has disappeared, there are traces – such as foundations – of the original palace. 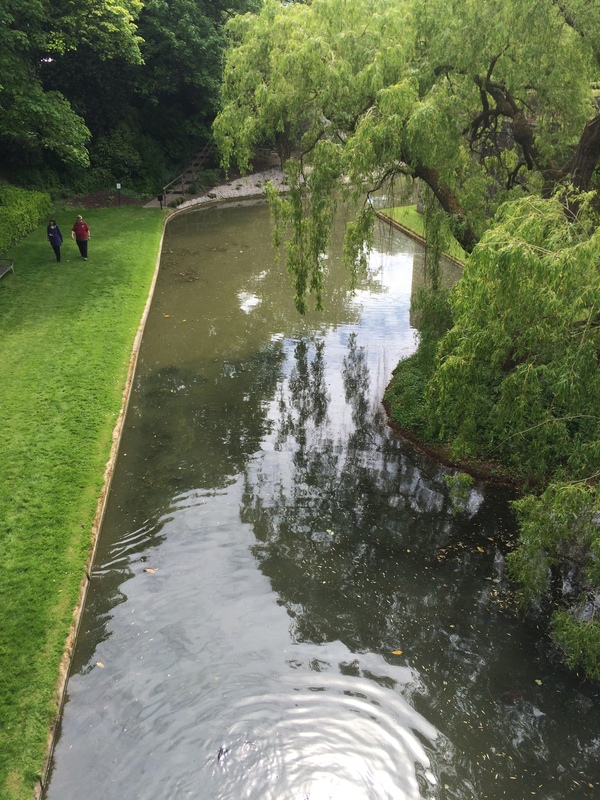 When I had finished looking round Eltham Palace, I got back onto the Capital Ring route. Initially it followed King John’s Walk (named after the son of Edward II), a quiet and historic rural lane linking the royal residence with hunting estates to the south which attracted well to do visitors from far and wide. Although I didn’t see any deer, as was the case five centuries ago, but horses grazed in the fields on both sides of the muddy path. If it wasn’t for a modern-ish housing estate at the edge of one of these then I would have been convinced I was in the countryside. With some youngsters helping muck out stables, central London felt a long way off. After passing through an estate where there is closed down fire station and kids are throwing stones at cars I grab some lunch at a fish & chip shop. Nearby, I found a low wall to perch on at the edge of a Shell petrol station – which cars wizz in and out of with their radios blaring out loud music – and munched away at my pie and chips. My vantage point on this busy junction – if I looked one way there is a mosque and the other a fried chicken shop – was a good place to reflect on a very contrasting Capital Ring walk (and London as a whole). One minute you are walking along quiet lanes, with stinging nettles almost blocking your way in places and horses grazing in open fields. Then minutes later, you find yourself needing to cross a busy road. Before reaching Crystal Palace Park – my destination for the day – I passed through a number of other open green spaces connected by shady residential streets, one of these being the wonderful Beckenham Place Park. 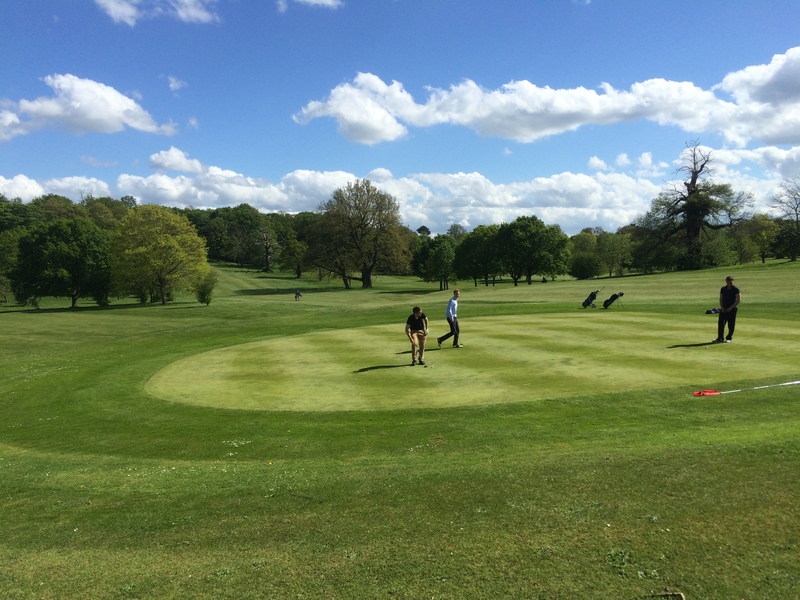 The route here runs along a woodland walk and then brings you to a raised spot overlooking the amenity’s golf course. I had a wonder around the park’s formal garden high up on the hill and then stopped near the clubhouse for a rest before embarking on the last leg of the day’s walking. To read about ‘the lost world of Crystal Palace’, check out my blog from 2014. The second half of my trip around the Capital Ring continues on Pastinthepresent.net later this summer. In the meantime, if you have missed any installments from my trek, you can read all the articles that have been published so far here.